Temperature control in an HPLC System is very important, because it affects retention times, and unless we have a diode array or mass spec detector, we rely on retention times to identify our peaks. Changing retention times means that at best peaks fall out of their time window, and can result in incorrect peak assignment. The situation is worse with refractive index detectors, because if the temperature changes even a little, the baseline drifts a lot!. With conductivity detectors, although the peaks do not change retention time much with temperature, the peak area changes by +/-2% per degree centigrade, so temperature control is vital for accurate quantitation. The three heaters we have to offer are made by Torrey Pines Scientific in California. TPS is owned by Tony Cassiano, who is not a chromatographer, but knows pretty much everything there is to know about temperature control. Hence their column heaters are among the very best in the world. I have tested all of them in our lab, and they work really well. We have three models to offer. All are in stock, and all are on special offer!. So if you have a little money to spend on your HPLC before the end of the financial year, this would make an excellent choice. Model CO20 - the new Economy column heater! It operates from Ambient + 5oC to 95oC, and can accommodate 1 x 25 x 4.6 column. The column OD can be 1/4 or 3/8". It gets to temperature quite fast and then holds rock solid all day. Unlike similar models sold by other companies it is virtually silent. Model CO50 - The new workhorse column heater/chiller! 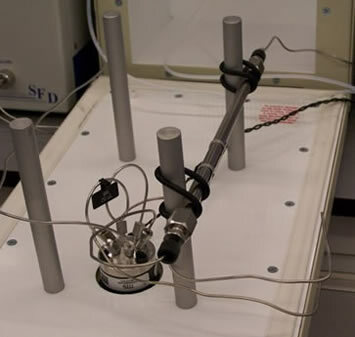 This model operates from 4- 100oC and can accommodate a single analytical column. It has Peltier heating and cooling and gives very precise temperature control, even at ambient. Once at temperature, it holds rock solid all day, and is really quiet. This model can accommodate four columns up to 1" diameter each! It is ideal for 30cm x 6mm columns used for GPC or Sugars analysis, but can be used for any system. There is a space in the door to mount a Rheodyne valve if required, and the unit has inbuilt RS232 control. We have sold many of these over the last 8 years and they work really well. they can control from 4-70oC, and hold temperature rock solid at the target temperature all day. The latest units heat up and cool down really fast. If you are in doubt which unit to buy, then buy this one. Its an outstanding column heater.